Prasoon Joshi (born 16 September 1971) is an Indian lyricist, screenwriter, poet and marketer. He is the CEO of McCann World group India and Chairman (Asia Pacific), a subsidiary of the global marketing firm McCann Erickson. He was appointed as the Chairperson of the Central Board of Film Certification on 11 August 2017. Prasoon has received the Filmfare Best Lyricist Award three times, in 2007 and 2008 and again in 2014 for the Hindi movie Bhaag Milkha Bhaag. He has also received the National Film Award for Best Lyrics twice, for his work in Taare Zameen Par (2007), and Chittagong (2013). He was awarded Padma Shri by the Government of India in 2015, for his contributions towards the field of Arts, Literature and Advertising. Prasoon Joshi spent his earliest years in Almora, in the north Indian state of Uttarakhand (then part of Uttar Pradesh). His father, D.K. Joshi, served as a PCS officer with the Civil Service of the State Government and later became the Additional Director of the state's Education Service. These early years all across the northern India – and spending time in places like Almora, Nainital (where his extended family and relatives still live), Tehri, Chamoli Gopeshwar, and later Rampur, Meerut and Dehradun – gave Prasoon a remarkable feel for the real Indian pulse that he is now celebrated for in his lyrics and advertising. His mother, Sushma Joshi, a lecturer in political science, performed for the All India Radio for over three decades. His parents are qualified classical vocalists and daily home life for the young Prasoon was marked with academic discipline, a rich vein of the artistic life and a strong sense of music and culture. He started writing early in life and published his first book at age 17, Main Aur Woh, a 'conversation with himself', inspired by Frederich Nietzsche's Thus Spake Zarathustra. Two more books followed, establishing him as an author. His latest book, Sunshine Lanes, a collection of his songs, was launched at the Jaipur Literature Festival in January 2013. Prasoon did his BSc and post graduation in Physics, then elected to pursue an MBA from Institute Of Management Technology, Ghaziabad. During his MBA education he decided to fuse his love for culture and art and his faculty for the commercial dynamic and make his career in advertising. Prasoon started his career with Ogilvy & Mather in Delhi. In just 10 years, he was appointed the Executive Creative Director of the Mumbai office. In early 2002, he joined McCann-Erickson as Executive Vice-President and National Creative Director. By 2006, he was the Regional Creative Director for South and South East Asia. In December 2006 he was promoted to Executive Chairman for McCann Worldgroup India and Regional Creative Director for Asia Pacific. Joshi created advertising campaigns for NDTV India (Sach dikhate hain hum), Saffola (Abhi to main jawan hoon) LG, Marico, Perfetti (Alpenliebe, Chlormint), and the Cannes-winning Thanda matlab Coca-Cola campaign with Aamir Khan. His Happydent television commercial was listed by Bob Garfield of AdvertisingAge as one of his personal choices for the Cannes Gold in 2007, and it was chosen by a Gunn Report poll as one of the 20 best ads of the 21st century. He also wrote the lyrics for CNN IBN's advertising jingle "India Rising" and Coke's Ummeed wali dhoop. Prasoon made his debut as a film lyricist with Rajkumar Santoshi's Lajja, a critical and commercial success, and this soon led to Yash Chopra's Hum Tum and a string of highly successful Bollywood films like Fanaa, Rang De Basanti, Taare Zameen Par, Black and Delhi 6. With Rang De Basanti (2006), he also became a dialogue writer. He won the Filmfare Best Lyricist Award for "Chand Sifarish" from the film Fanaa in 2007 and for "Maa" from Taare Zameen Par in 2008. He has won the prestigious National Award twice. The first for his work in Taare Zameen Par and the second one in 2013 for Chittagong. He had also written the script for the award-winning 2014 film Bhaag Milkha Bhaag. In 2008, he was invited as the Cannes Jury chairman and in 2009, he was named among the exclusive 10-member Cannes Titanium and Integrated Jury at the Cannes Lions International Advertising Festival. In 2006, he was chosen a 'Young Global Leader 2006' by the Forum of Young Global Leaders, an affiliate of the World Economic Forum, In 2007, he was asked to be a judge of the nationally popular reality singing competition Dhoom Macha De on NDTV Imagine. Joshi was part of the select three-member Core Creative Advisory Committee for the Commonwealth Games 2010 opening and closing ceremonies, with Shyam Benegal and Javed Akhtar. When Prasoon watched the film Sikander, he was inspired by it and wrote a song called "Dhoop ke sikke". Later, this song was incorporated in the film. Prasoon Joshi and Aamir Khan have decided to prepare 50 short films on malnutrition after being invited by the prime minister of India. According to Mr. Joshi, Aamir and himself get along well because they do not compromise their work. He was awarded Padma Shri, the fourth highest civilian award of India, in 2015. Prasoon met his wife Aparna, also an advertising professional, while working at O&M Delhi. They have been married for over a decade and have a daughter named Aishaanya. ^ "Humbled, motivated: Prasoon Joshi on winning Padma Shri". 26 January 2015. ^ Meet Prasoon Joshi, India's ad guru by Shyamal Majumdar. Rediff.com, 19 October 2005. ^ Prasoon Joshi Interview Archived 21 February 2010 at Archive.today creativeuttarakhand (Myor Pahad). ^ a b Breakfast With Prasoon Joshi, The Economic Times', 3 May 2008. ^ "prasoon-joshi-bollywood-mann-ke-manjeere". Economictimes.com. The Economic Times. Retrieved 22 November 2015. ^ McCann top deck gets a new look The Economic Times, 16 December 2006. ^ Will there be Happy sent smiles at Cannes? by Pritha Mitra Dasgupta. DNAindia.com, 16 June 2007. ^ Dasgupta, Pritha Mitra (3 December 2015). "Prasoon Joshi's Happydent commercial among 20 best ads of 21st century". Economic Times. Retrieved 1 January 2017. ^ Sinha, Suveen (2 December 2015). "Happydent Palace ad is among 20 best this century". Hindustan Times. Retrieved 1 January 2017. ^ Prasoon Joshi. Rising Indian Business Line, The Hindu, 8 February 2007. ^ Umeed Waali Dhoop by Prasoon Joshi Lyricstaal, 16 June 2014. ^ Adman Prasoon Joshi has now turned dialogue-writer! The Times of India, 12 December 2005. ^ "Archived copy". Archived from the original on 8 July 2011. Retrieved 23 February 2011. CS1 maint: Archived copy as title (link)Prasoon Joshi on Cannes Titanium jury The Economic Times, 27 February 2009. ^ Prasoon Joshi chosen Young Global Leader Rediff.com, 13 January 2006. ^ NDTV ropes in Shankar Mahadevan and Prasoon Joshi Archived 13 July 2012 at Archive.today Wednesday, 28 November 2007. ^ "Mirchi Music Award 2009". www.radiomirchi.com. Retrieved 15 February 2019. ^ "Nominees - Mirchi Music Award Hindi 2010". 30 January 2011. Retrieved 30 September 2018. ^ Parande, Shweta (28 February 2014). "Mirchi Music Awards 2014 winners: Shahrukh Khan, Farhan Akhtar honoured; Aashiqui 2 wins 7 trophies". India.com. Retrieved 24 April 2018. 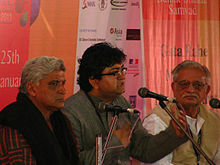 Wikimedia Commons has media related to Prasoon Joshi.